For almost forty years I have been using the I Ching as a foundation for my compositions. I use it to shape stucture, melody, harmony, rythym, mood and as a tool for inspiration, I do not use the I Ching in a method that could even be described as chance. The I Ching is a system from the ancient Chinese used for divination also known as the book of changes. It's a binary system with a range of 64 possibilities (8 x 8 = 64). The rising and falling energy flows in the hexagrams suggest music form, melody line, emphasis points and much more. The Pattern of the lines suggest scale patterns. The 64 different hexagrams give us 64 different scales, and the correlation of the 64 scales to the harmonic series in the seventh octave gives each scale an individual vibration rate with the harmonics 64 through 128. It's a grand pattern full of musical color. CD38 Richard Burdick performs trios from the late renaissance: all 6 Broken Consort Suites and both Flatte Consort suites - 36 track of Christmas like music. Beautiful authentic practice classical era natural horn music, for horn trio and duo. A very popular style of music in Beethoven's lifetime. Nothing else like it for horn ensemble! These trios are full of memorable tunes interwoven in fascinating ways, with wonderful twists and turns. 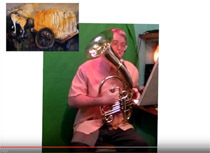 Thanks to IMSLP a number of works have come to my attention from moderately obscure composers, which I'm happy to present here performed on the Natural horn. Nineteenth Century composers Du Puy, Comte de Champigny, Alexandre Javault, Johann Peter Heuschekel. Released February 2013. There are many lesser-known 20th century composers, who have great worth! A big THANK YOU to composer Andrew Imbrie (Pulitzer prize finalist in 1995) for teaching me to use Black-line printing for my compositions in the 1970's. I am proud to have had his influence. 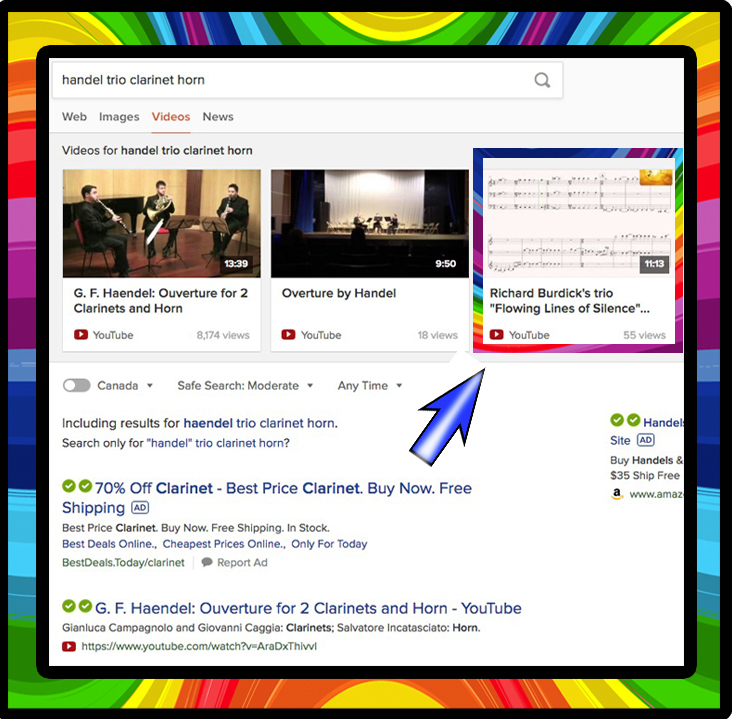 I was very happy to see when I searched for "Handel trio clarinet horn" my demo video for my composition "Flowing Lines of Silence" came up right at the top. The demo of Richard Burdick's Yellowstone Suite, Opus 235 is now available on you tube for your listening a watching pleasure; enjoy. 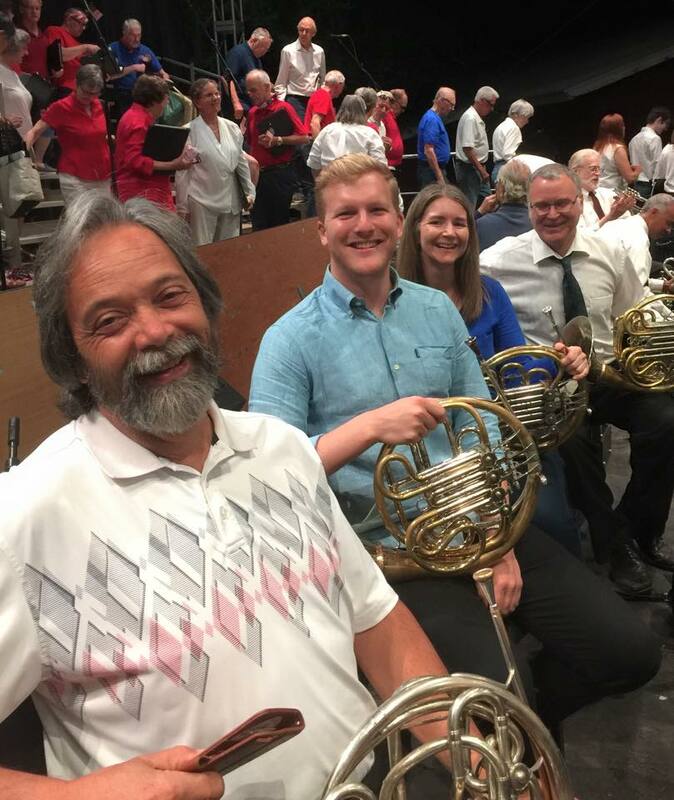 I have been proud to be the leader of the “Music in the Mountains” summer festival horn section, my 26th year with the festival. Plaudits to Cara Jones (2nd), Frank Hammarin (3rd), Phil Richardson (4th). What great fun; 7 concerts in 12 days. A sucessful run of performances for Music in the Mountians in Grass Valley, California. Seven concerts in twelve days! June 22 - July 3, 2018 my 26th year with the festival. The Mindset, Op. 242 nonet is complete almost the same time the U.S.A. celebrates its 242 year. Hard work on things that have not been released yet: Op. 242 The Mind Set and Op. 236 The Obvoius. Hard work on things that have not been released yet, must notably microtonal works: Opus 206 HLP Flows, Op. 207 Eternal Melody And Op. 232 I Ching Harmonic Signatures. I Received a really nice note about my performance in the show "Cinderella" this August. 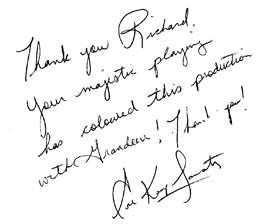 "Thank you Richard your majestic playing has coloured this production with grandeur!" CD40 (9-9-2016) is now one CdBaby. CD39 is being release August 3rd, 2016 - A Squeal to CD15 Bach Easter Oratorio and my Favorites album - CD17. © 2013, 14, 15, 16 & 2017 I Ching Music. and Richard O. Burdick. All rights reserved.